The hottest advertising trend of 2018? Billboards. On the streets of San Francisco — ground zero for all things online, virtual, and digital — tech companies are sneaking out into the “real” world. Apple and Google ads loom over Highway 101 on enormous 14’x48’ sheets of vinyl. Eaze posters cover MUNI busses. Bitcoin placards line old Victorians. In every side-street, alleyway, and hole-in-the-wall, the likes of Netflix, Everlane, Airbnb, Asana, and Twilio are leveraging the hottest advertising medium in town: Billboards. A decade ago, billboards were seen as outdated and irrelevant, relegated to informing you of the Cracker Barrel or gas station at the next exit. Today, in the midst of an online marketing boom, they’re one of the fastest-growing ad commodities on the market. How has the world’s oldest advertising medium managed to survive the onslaught of a digital revolution? To a time of Lion Conquerors! Harlequins! Bearded Ladies! In the 1830s and 40s, circus purveyors vied for traffic with sensational posters. A few decades later, the concept evolved into modern billboards: Large signs along roadsides that hawked products to an increasingly consumerist society. By the 1920s, entrepreneurs were buying fleets of them in prominent areas. 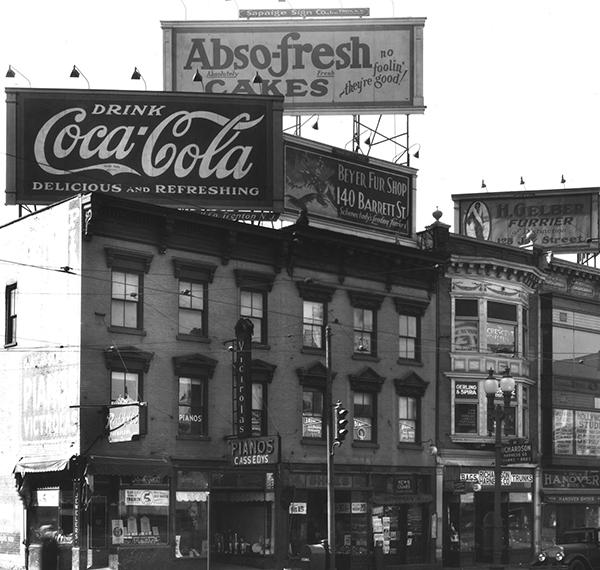 Fueled by the rise of the automobile, billboards soon populated highways across the country, tempting Americans with eye-catching ads for Coca-Cola, Kellogg, Palmolive, and Burma Shave. In the days of limited metrics, billboards were the ad medium du jour. But more measurable formats like radio, television, and the internet came along, bringing with them a demand for hyper-granular data points, social targeting, impressions, and engagement. By all accounts, billboards should have become a relic of the past — but they didn’t. In advertising parlance, billboards fall under the larger category of “out of home” (OOH) ads. This includes every type of ad you see outside of your home, be it on a subway, a truck, a telephone booth, or the body of a naked cowboy. Billboards make up 66% of this market. Across the US, some 370k billboards are in active operation, with ~15k new ones added each year. They are owned by more than 1.2k vendors (including some big dogs like OUTFRONT, Lamar, and Clear Channel), who generally lease them out to advertisers in 4-week blocks. This type of advertising only makes up about 7% of the total ad spending pie. 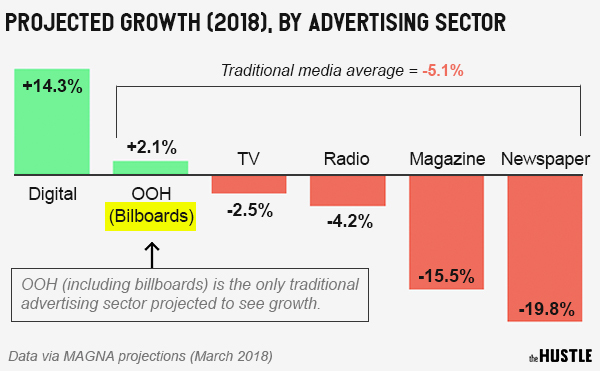 But while radio, print, and television ads have declined in prominence, OOH ads have enjoyed 31 consecutive quarters of growth, and a 35% increase in ad spend since 2010. By 2021, billboards are expected to grow to a $33B industry. In popular markets, tech companies are engaged in a fierce battle for the best billboards. Earlier this year, Netflix plunked down $150m buy 32 billboards along the Sunset strip in Hollywood. Alibaba, Google, and Reddit co-founder, Alexis Ohanian have also hedged bets on billboards and the new tech that’s powering them. What the hell is going on? What’s driving this renewed interest? When John Laramie first got into the billboard business 10 years ago, it was a floundering space that was behind the times. So, Laramie built an interactive database that mapped billboard inventory across the country — a system that automated the entire process of finding, buying, and tracking billboards. His company, Project X, is one of many in a growing ad-tech space focused on “optimizing” every nook and cranny of the billboard industry. Instead of crumbling in the face of evolving technology, billboards have evolved with the times. Though rooted in the physical world, today’s OOH ads have progressed to the point where advertisers can now track nearly all of the same metrics with a billboard as they can with a digital ad. Geopath, often dubbed “the Nielsen for billboards,” enlists hundreds of millions of mobile data points to measure a slew of granular, anonymized demographic information on billboard passersby. Lamar, one of the largest billboard owners in the US, works with third-party data providers to collect information on everything from weather to traffic conditions, and uses it to change its digital billboards in real-time. This type of optimization is made possible by the tremendous amount of anonymized, location-based mobile data being utilized by the OOH industry. “A brand can come to us now looking for a very specific audience — female, aged 35-40, household income over $100k, likes to shop at certain stores, and eat certain foods,” says Betsy McLarney, founder of the OOH ad agency, EMC Outdoor. “And we know exactly where to put the billboard”. By working with digital instead of fighting against it, the age-old billboard industry has managed to stay relevant, desirable — and, most importantly, effective. A recent Nielsen study found that combining billboards and digital ads can lead to a 4x increase in online activation. Other studies have shown billboards can lead to lifts of 54% in search traffic, 38% in Facebook interaction, 25% in Instagram engagement, and 47% in sales activation. That’s better than radio and print — and just below what you get from a TV ad, for the fraction of the price. Billboard pricing depends on a number of factors, like location, population density, visibility, the size of the board, and demand, and can run anywhere from $600 for a sign on a Nevada highway, to $20k for a prime NYC building top. But when you break down the CPM (how much it costs for every 1k people who see the ad), billboards are, on the whole, more affordable than other types of ads. 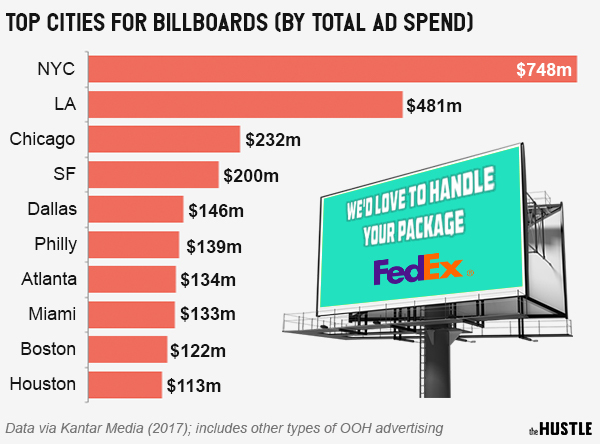 With an average CPM of $5.22, billboards are, in may cases, less cost prohibitive than online ads, which continue to balloon in price. These stats have enticed tech companies. Though billboards only make up about 7% of the average brand’s ad budget, the tech space averages 3-4x that. Four of the 10 biggest billboard spenders are tech companies (Apple, Google, Amazon, and Netflix). Startups, in particular, are drawn to billboards. In cities like San Francisco and NYC, VC-funded brands are spending tens of millions of dollars to blanket popular areas. In the 1970s, we were exposed to an average of 500 ads every day. Today, that figure has ballooned by a factor of 10. The competition for our eyeballs is fiercer and more complex than ever before — and it has been compounded by the rise of online ads, which multiply like fly larvae every time we open our internet browsers. Advertisers only have milliseconds to capture our ever-shrinking attention spans in a crowded, fleeting space. In this era of oversaturation, billboards enjoy a unique advantage. In a way, we’ve come full-circle, back to the circus. Today, the ringleaders are corporations — and they’re returning the roadsides in droves, employing a mix of technology and sensationalism to tap into our primal desires. And, at least for now, it seems to be working. Lamar Advertising Company (Nasdaq: LAMR), a leading owner and operator of outdoor advertising and logo sign displays, announces that its board of directors has declared a quarterly cash dividend of $0.92 per share payable on December 28, 2018 to stockholders of record of Lamar’s Class A common stock and Class B common stock on December 17, 2018. Lamar Advertising Company today announced that Sean Reilly, CEO of Lamar Advertising Company, is scheduled to participate in a question-and-answer session at the Wells Fargo Media Forum in New York, NY on Thursday, November 15, 2018.